Tajiks – a nation that retains and honors the feast of their national traditions and transmit to future generations. Until now Tajiks (especially in villages) go to the national clothes: men in embroidered robes and skullcaps, and women in embroidered colored dresses with trousers a shawl on her head necessarily, many girls still 40 braid braids. Etiquette. In the Tajik culture of obedience, humility, hospitality, respect as the main component of human interaction. Ethics: – In Tajikistan, the man has no right to enter the house, which is only a woman, as well as girls should never be alone with the boys; – If the handshake heart to put his left hand, the gesture will be a symbol of good manners and deep respect; – In public places always men and women are separated; – When a visitor comes to the house, rising from their seats, it must therefore be to congratulate him; – Members of the older generation has always enjoyed special honor – always the bazaars bargaining is appropriate. If in Tajik society, these moral norms are ignored or violated, of freethinkers, at best, will go gossip at worst – he was subjected to persecution from society. Tajik manners and rituals are an integral part of life and origins are ancient population. Among them a special place wedding ceremonies, which is dominated by magic and fertility charms, the cult of ancestors. Holiday snowdrops. Tajikistan – a country of mountains. Snowdrops – proof of the arrival of spring, which serves to drive to the Tajik great holiday. The first guy who finds snowdrop is a real lucky. In the mountains in a hurry all the guys to pick flowers and give their mothers, sisters, teachers – as a symbol of rebirth of life, a symbol of youth and krasy.Potim in every family prepare the traditional pilaf, which is called – “Oshiboychechak” and gather all friends and relatives. It is preparing for the celebration of Nowruz – the main holiday of spring. Nowruz. “Nowruz” – means “New Day”. Tajiks celebrate its 21 to 24 March, announced these days weekend. On holiday in the spirit of folk traditions organizing games and activities: horse racing, fighting athletes, songs, dances and festivals. Traditionally focuses on the design and preparation of festive feast. Covering tables, not necessarily serve only food, also put on 7 predmetivnazvy dishes and beeches that start with “s” and “sh”. Thus, a two table “haftsin” and “haftshin.” Moreover, the “son” and “tire” – the name “p” and “w” in the alphabet of the Persians, and “Haft” means – “Seven” – sacred figure of Zoroastrianism and Islam. Saira Lola. Holiday tulips. 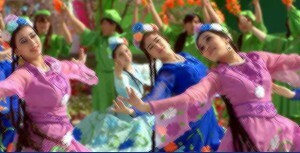 This holiday is associated with dance and choral music. This holiday zyavylosya not scratch, Tajikistan – native home of tulips. It became a source of tulips Tajik emergence German tulips. Chayhona. Residents of Tajikistan enjoy their tea tradition in local schools, called “Chayhona”, ie “Tea House”. Chayhona – a place where men get together and discuss the latest news, or problems in your life. In Tajiks are custom according to which, dopyvshy last drop of tea overturn his bowl on the table. This action means that a person does not want to drink tea, and only willing to talk. Tajik wedding. One of the most popular customs of the people is the wedding. Matchmaking – is the first ceremony connected with marriage. There is a formal representation of young betrothed appointed day, meeting families and discussed the amount of potassium. Still bride-price essential attribute of the wedding. Engagement. In Tajiks word “engagement” has three meanings: “kabuldoran” (“own consent”), “oshhurakon” (“meal pilaf”) and “hail” (“purity, whiteness”). Parents of the bride’s engagement to bring the white matter, guaranteeing the purity and integrity of his daughter. The peculiarity of Tajik wedding is that it is always defined in the bride’s home. It covered tables, comes the bride and the guests are treated. For three days he has to spend in building future wife. Then come his friends and take a couple of the groom’s house. For the first year tradition of youth are required to live in the house of her husband, and only then can move into their own homes. The ritual tradition. In Tajikistan deceased according to Islamic tradition to prepare the funeral. The canons of Islam strictly forbid section. The person must be buried before sunset on the same day when she died. The body is washed, wrapped in a white shroud and placed in a coffin. Three days a wake going away, which is served as a traditional Middle Eastern meal pilaf. The same ritual is conducted after 7 and 40 days, six months and one year after the person’s death. This entry was posted in Aesthetical, Ethical, Social and tagged tradition on 15/07/2016 by Mary.